I have been looking for a straightforward way of keeping track in which minutes I've found geocaches for the West 76 Degrees Longitude Challenge. When I started keeping track a couple of years ago, I had hit 11 of the 60 minutes, and I made a list in that blog post. 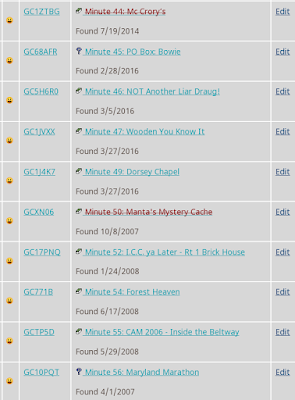 As I found more minutes, I had been updating blog posts, but that was not very organized, and didn't keep track when I didn't feel like blogging about every single find. There is a checker for this challenge, but as I noticed last year, it got confused by the event cache I attended, which doesn't count for this challenge. I actually wrote to the maintainer of that checker about the glitch, but I never heard back. I had been keeping track of things in a text file, but that was inelegant, as well. 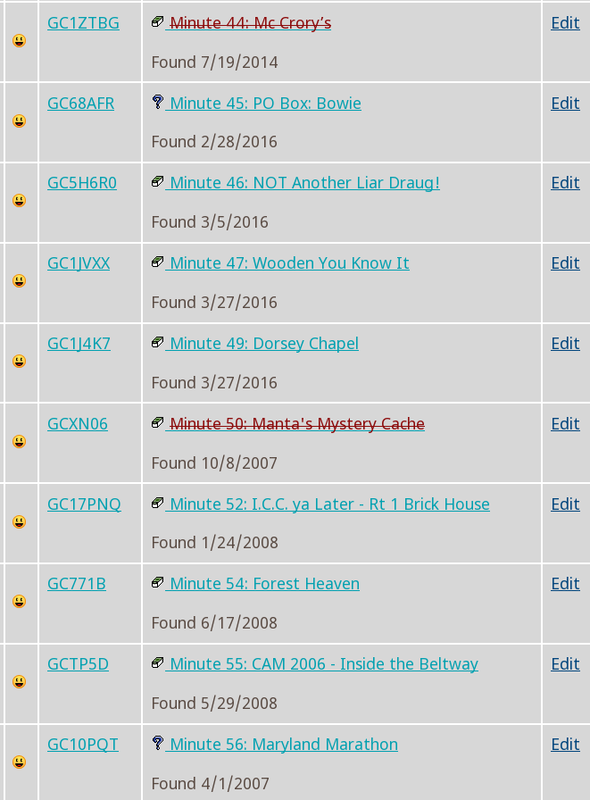 It finally hit me that a bookmark list on geocaching.com was the way to go. So I made one. Here is an excerpt that includes Minutes 47 and 49, which I found this past weekend. Anyway, that gives me 23 minutes total. The three to the west shouldn't be too hard, and I can get most of the thirties in Anne Arundel County. After that, I may stall on this challenge. Oh, and that checker? It now seems to properly exclude the event cache. Since it list 37 minutes I lack, I have confirmed my list.